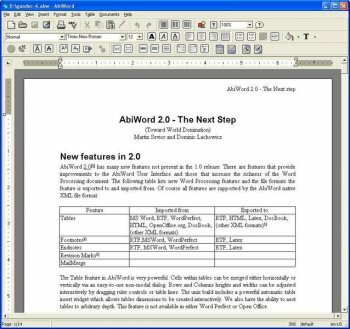 AbiWord is a free word processing program similar to Microsoft Word. It is suitable for typing papers, letters, reports, memos, etc. It is designed to integrate perfectly with the operating system it runs on. It will take advantage of the functionality provided by the system, such as image loading or printing capabilities. The installer doesn't even detect the presence of the latest redistributable installed! Otherwise, this app isn't bad. Moreover doesn't even check for installed C++ Redist. files and installs an older distro aside the newer version. I like Abiword, it's fast to start, works on windows and linux equally well. and for 99% of what I use a work processor for.. it does the job perfectly well. For 99% or maybe even 100% of the things that most (average) users will ever need from a word processor is in there already. Pros: 1.) No problems with many, simpler Word files. 2.) Nice new icon. Cons: 1.) Grammar check won't turn off (settings will not save, even after un/re-install). 2.) Puts MS Visual C++ Redist. files on separate drive (and doesn't delete after install). 3.) Uninstall doesn't remove all files (esp. in Start Menu). Needs registering, but if you open and close it a couple times you'll get a dialog box to skip registration altogether. great, well above Wordpad but without being bloat. don't let the few icons in the toolbar mislead u, and revise the menus! When all you need is a word processor, why get the whole suite? This gem of an app and Gnumeric are all 90% of normal people need in their full-blown office suite. 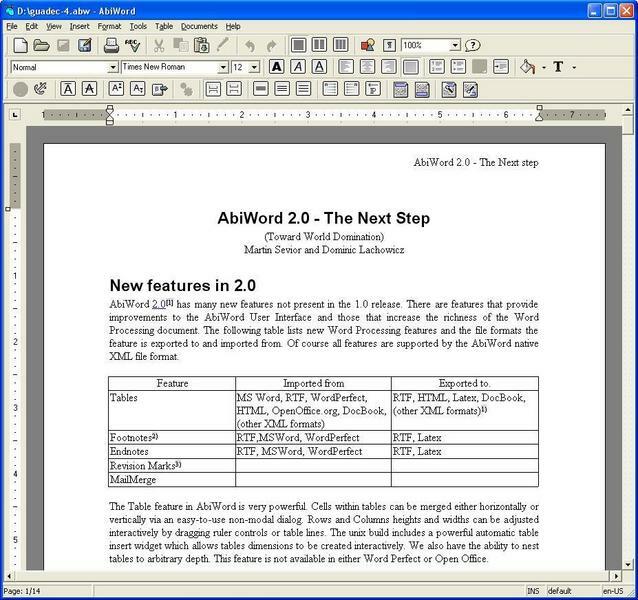 Abiword works well, runs on every OS, and I mean EVERY. Does all you need, has a portable version, and the native .abw format is extremely compressed, not to mention it will tar gzip files and untar gzip them as well. If you want a word processor, check this one out. Word and Writer are great if you want to do complex stuff, or don't mind using software that takes a lot of resources even though you'll only use 1% of it's features, but for me, when on older hardware, this simple, quick-starting word processor fits the bill. It's functional and it doesn't take up 500Mb on my hard drive. If you want Microsoft Office you're looking in the wrong place. not bad but not quite up to speed but making progress. good job. The concept is good and two stars for being Open Source but for me -- I choose to pay the shareware fee and use Atlantis word processor. Its all the things AbiWord should be (or perhaps most of the things, given its not free). zridling, same here. I have to say that I am very disappointed that AbiWord has not support ODT natively yet (and the plugin is very flawed), however, I can find in the newest changelog: "the addition of a new experimental OpenXML import filter".